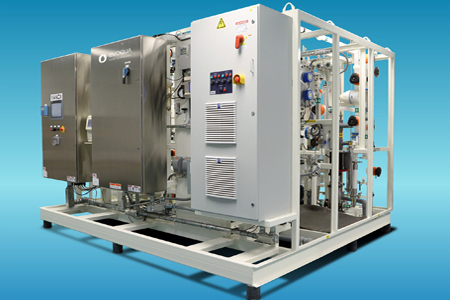 Evoqua introduces a method superior to traditional ozone or peroxide based processes for removing total organic carbon (TOC) in point-of-use (POU) systems. Our proprietary advanced oxidation process used in the Vanox® POU system can consistently reduce TOC to 0.5 parts per billion (ppb) and treat seasonal TOC variations in feed water. This is important because TOC elevations above 1.0 ppb can directly affect the manufacturing process, significantly impacting product yields. Many immersion lithography tools require low organic content for warranty but their impact on process performance cannot be understated. The repeat orders for Vanox systems by nearly every factory they are placed in should be an indicator of how these tools can pay for themselves. The Vanox system removes and/or controls urea and IPA, the primary organics that can require a more elaborate treatment. These difficult to control organics have been proven to impact yield and device performance especially at the most demanding process steps. THM (Trihalomethane), such as chloroform, which is generated as a by-product from the use of chlorine in municipal water treatment is readily controlled, as well. In addition to TOC reduction the platform exceeds the ITRS specifications for particle reduction less than 100 unit per liter at 0.05 microns, critically stable temperature controls, low trace metal and gas removal. Each of these parameters have been proven to provide a stability for process control that only the Vanox POU platform can offer. The fully redundant (n+1) designed Vanox POU systems offers 365 days, 24 hours uptime. The Vanox family of systems ramps to meet the incoming demand required preserving power, capital costs and chemical. By utilizing a suite of analytical measurement tools the tool offers continuous process control and access to streaming process data for constant tracking of the system and environmental promoters that it is responding to.